No, not THAT Funky Bunch (although who doesn’t love a little 90’s pop in the morning?). I’m talking about that mishmash of kids that, despite all of your SLP scheduling heroics, you just can’t fit into the schedule anywhere else. You know the group I’m talking about. It’s the one with a 5th grader with a stubborn /r/, a 3rd grader working on following multi-step instructions, and a kindergartner who stutters. This is the sort of group that can make even the most seasoned clinician shake their weary head and wonder what on earth they’re going to do to give each of them the attention they need. First of all, I want to say that we’ve ALL been there. 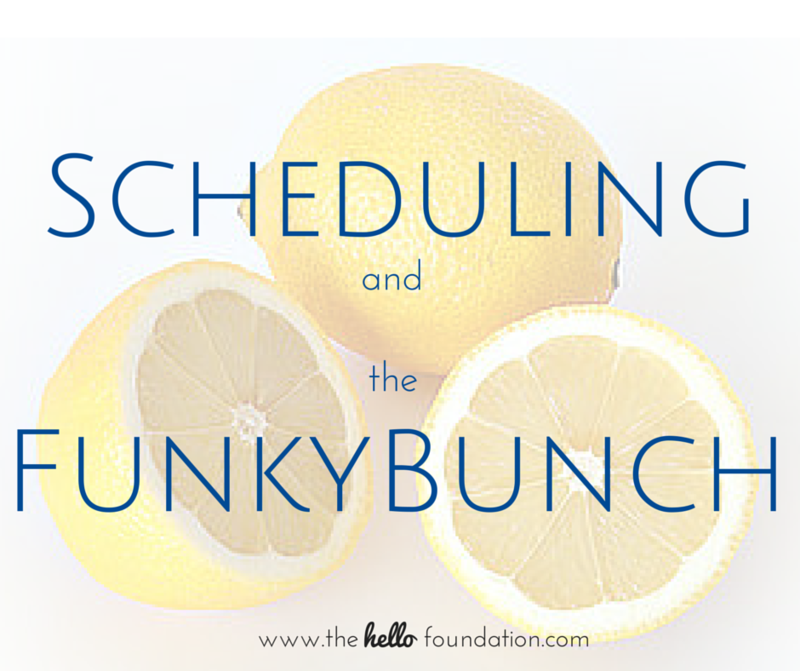 Scheduling is perhaps the most complex thing the school-based SLP does all year. So many moving parts – student needs, teacher needs, admin needs, reading blocks and math blocks and specials and lunch and . . . oy. I start to sweat just thinking about it. You do your very best to get students into groups that maximize both student growth and your sanity, and I’m wagering that you do a pretty great job at it. Yet still, the Funky Bunch haunts you. Maybe you ended up with this crew because you were looking for a solid 20-minute block in which to see them all. Take (another) peek at your schedule. Could you see them each individually for 10 minutes 2xweek? Or 5 minutes daily? This sort of schedule is fantastic for the artic kids especially. Pull ’em into the hall, drill drill drill, shoo them back into class where they belong. Mostly always, big kids really like feeling like they’ve got the inside track on school life, and they relish the opportunity to help out the little guys. This concept applies for kinders and 5th graders, 8th graders and 6th graders, 9th graders and 12th graders, and every grade in between. Empower the older student to act as a clinician while you give focused attention to the other student(s). They can surely listen for overt artic errors, read 2-part directions to be followed (while working on their own smooth speech?! ), and do other such things. Break your session into 1 or 2 or 3 mini-sessions, with students rotating through different stations every 7-10 minutes. Have an app station, a movement/art/game station, and a direct instruction station with you. A group like this is the perfect place to maximize self-management and -monitoring techniques. Set things up so that they can walk in the room and grab their own materials, take at least some of their own data, and chart their own progress. You can use bins or folders or whatever, just as long as it’s not up to you to be managing all of that stuff in the short 20 minutes you have together. If they can get to your room independently, all the better. In my tenure as a contractor with Hello, I’ve have had the great fortune to have been called into short-term duty to help out many an SLP who was utterly swamped. (Sidebar: Yes, we do that! Yes, it’s awesome!) One of the first things I do when I land in one of these placements is sit down with the resident SLP and look at the schedule. Sometimes we don’t come up with any changes, but you’d be amazed at what a colleague might be able to see that you’re not. It’s that whole forest for the trees thing. Bring your scheduling woes to your next SLP meeting and see if you can buddy up with someone for a schedule audit. If nothing else, you can commiserate with each other, right? Above all Else . . .
be kind and gentle with yourself. Do your best to help the kids in the Funky Bunch and make a commitment to yourself to continually re-evaluate whether you can do anything differently or better. And when you feel like giving up, come back to this blog post and watch this video. If the world survived this era in music, you’ll survive your Funky Bunch.